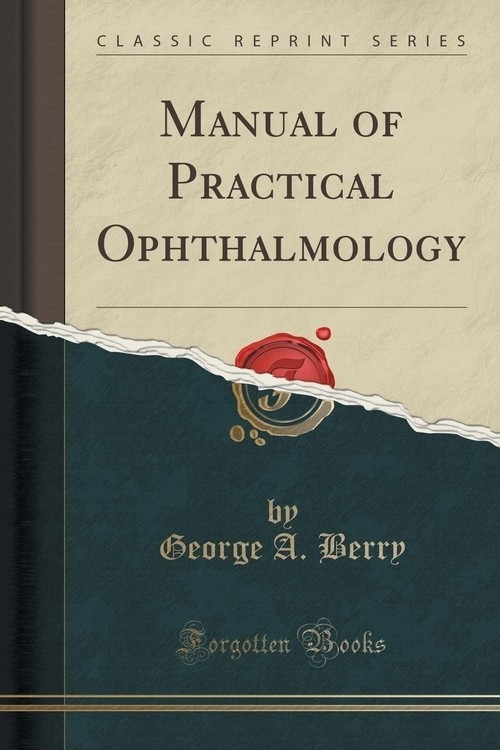 Opis: Manual of Practical Ophthalmology (Classic Reprint) - Berry George A.
Ophthalmology has long held a foremost place amongst the various branches of Medicine. In diagnosis, as well as in treatment, it had already attained to a high degree of precision at a time when modern scientific methods had as yet barely begun to foreshadow the results which they are now almost daily achieving in other departments. Having thus early taken a leading position, the possibilities of further advance seem in the meantime to have been proportionately restricted. Coincident with the rapid strides made in surgery generally, and with the many discoveries which seem not unlikely to lead eventually to real therapeutic advances in internal medicine. Ophthalmology has practically been at a standstill. This being so, and as there are already not a few text-books on diseases of the eye, an addition to their number can hardly claim to be called for because of the latest developments of the subject being either very extensive or very important. A large experience as a teacher has, however, shown me that an adequate appreciation of the nature and treatment of even the commoner forms of eye disease is far from being general. I venture to hope, therefore, that there may)e room for a treatise which is both short and essentially practical, and which, while representing without unnecessary detail current opinions as to pathology, gives expression to the authors individual experience as regards diagnosis and treatment. Szczegóły: Manual of Practical Ophthalmology (Classic Reprint) - Berry George A.
Recenzje: Manual of Practical Ophthalmology (Classic Reprint) - Berry George A.